NEW FREE BOTS! Bots For Agar Serv! Welcome to AgarServ.com › Forums › Agar.io generic topics › NEW FREE BOTS! Bots For Agar Serv! This topic contains 49 replies, has 16 voices, and was last updated by abdullah yasser 1 month ago. Hello! i have been searching around, and found that agar powerups is no longer a thing, and crashes for people. I have edited some of their script and it now works! It spawns 125 – 250 bots, but only a certain amount of them actually spawn because of the “Bots Per IP” Rule. so to get the bots i have created, please go to my website here, and look at the instructions! Thanks everyone, and i hope one day i can add more bots, and have more fun with these, and bring them back to agar.io! Bots work well when you create your own server > Go to server options > Change connections Per IP to 50! this way the bots can spawn and you can have to around a solid 50 or more! Here is a little proof of the bots. i was in a game and gyazo was being stupid, so bots were going bottom left :p but its ok.
use browsec extension too or it will not connect due to Bots Per Ip rule. This reply was modified 2 years, 9 months ago by G.
is there a better way to do this? oh and do you like my post? thanks! This reply was modified 2 years, 9 months ago by AgarThix. Thank you, and i didn’t try to steal! this is an outdated picture.. i edited bots again, changed color scheme, names, bot names, etc.. so i do give credit to you too! please look at my website pictures, and here is a screenshot of it too! sorry about confusion.. hope this clears anything up! also, how did you find this?! that amazes me! if you’re interested we can discuss through skype.. please let me know if you are interested! and again, i am not the most skilled at code AT ALL, but its summer and i’d love to learn! so please, if you ever want to help, or give suggestions on how to fake your IP, since it is stored within their data and not real time is what i am understanding, then maybe you can help me out! thanks, and i’ll look into it further! Huh. I’ve been doing the same. Infact. I’ve made my Own little Agario Powerups. I also fixed the settings. So now I have a Complete working Agario Powerups. hey, it didn’t let me add you! i think you gave me the wrong name because nothing showed up…. I’ll add ya and give ya a few tricks on browsec and give you tons of proxies. I’ll add you now. Hey! i’m adding you now! thank you, and good to see someone else doing the same thing! not posted what? the encryption key algorithm for protocol 8? I downloaded your bots! The zoom didn’t work, but i fixed it and successfully rekted a server by a big spawner cell! Final mass of spawner was 6522916. When I was downloading, adf.ly downloaded a virus. I deleted it, so be careful when using url shorteners to get money (Money has to come from somewhere, you know? And selling control to infected PCs is a source of it.) such as adf.ly. Wow! thank you for downloading! yes i am using adfly to try and bring something in, because i am not currently at my nob.. thank you! and i will delete adfly off the link, because i don;t want that for my users! thank you very much and i hope you enjoyed it! sorry for being inactive.. been busy :p. thanks for fixing it! i am currently learning HTML and CSS on codecademy, and i think i’m getting somewhere! thank you, and have fun! again, that is amazing! very happy it worked! can you help me use it with agar.pro? i couldnt find the ip :p thanks! Website has been updated with fresh, new bit.ly links! thanks for bringing this issue to my attention, and i am glad i could solve it! nevermind, i just glitch out when i try to join the IP. i think i need to match – agar.pro in the index, so it won’t crash.. if i am wrong, please correct me, and help me out! Nice work man! i’m not entirely sure what you have changed besides the bot name, but it works perfectly! if you’d like to show me the 2 lines you have changed, that would be much appreciated! i’d also like to put this in my next update! so if that is something you are ok with,Please let me know! so i can give you the right credits, and make sure you are recognized properly! Yes, you can use my script, but it’s compatible ONLY with agar.pro and some other private servers, I will try to make a universal script next time. But don’t forget to change the bot name! 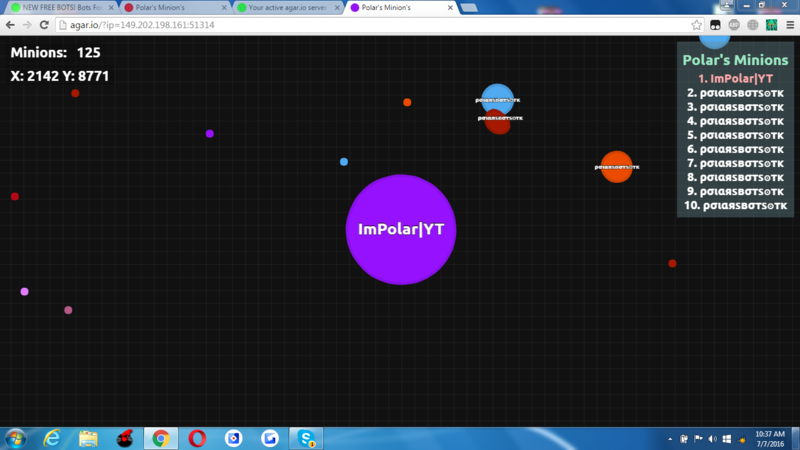 It uses normal agar.io protocol. So you won’t need to modify anything to make it work there. However bots might require proxies(I’m not sure about that). 2) Awesome! and how do you add proxies.. im not sure how this works at all, and i don’t know where to start to implement something like that.. Thanks! This reply was modified 2 years, 9 months ago by Yo Polar. I can add proxies if someone will give me a way to inject old agario before 5 may update (WITHOUT browser extensions!) when you go to agar.iо. Other than that, I don’t know how you can use proxies on agarserv. I meant that I have bot script with proxies that worked before 5 may update. If I can manage to load old agario somehow, I will be able to use agarserv bots with proxies again. hmmm this is interesting i can kinda help on this but im not too much active on the internet. altho if i will help i only help making it for agarserv and ogar servers not official agario servers. This reply was modified 2 years, 9 months ago by mastkillxp. can I get the link for browsec? 3. Go to that link. 5. Go to the link again and repeat until you get what you wanted. G, I was wondering If You could probably help me. I was wondering If you could fix my edited version of Hellcats agario powerups To make it work on a server. http://kutuart.com/experimental.php? ALSO Polar. Why are you never online on skype? how do i get bots ! ?